A major part of the evidence that a big change is happening is found in the sharp increase in earthquakes that began when the ‘dimming’ of the Sun began that the Ulysses spacecraft had reported. A tight connection exists between the two phenomena. With the Sun being surrounded by a dense field of electric plasma particles, which at its surface power its luminance, the Sun also accumulates plasma in the never-ending electric rain upon it. With the plasma particles being 100,000-times smaller than all atoms are, the Sun absorbs vast quantities of plasma in the form of protons. However protons have a positive electric charge by which they repel each other. The repulsion establishes a limit to the plasma density that the Sun can absorb. The limit is determined by the external, incoming, plasma pressure. 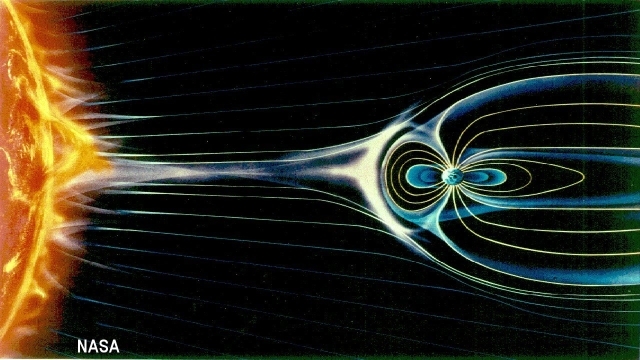 When this external pressure weakens, whereby the Sun also becomes dimmer, the internal pressure can no longer be contained and becomes vented into space in the form of erupting coronal mass ejections. 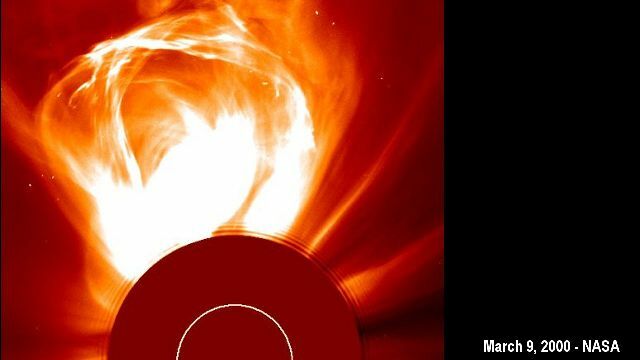 While mass ejections are a means for the Sun to maintain its plasma-pressure equilibrium, the mass-ejections tend to increase when the external pressure is sharply reduced, as Ulysses saw the beginning of. For us on earth, this means that the earthquakes are increasing. 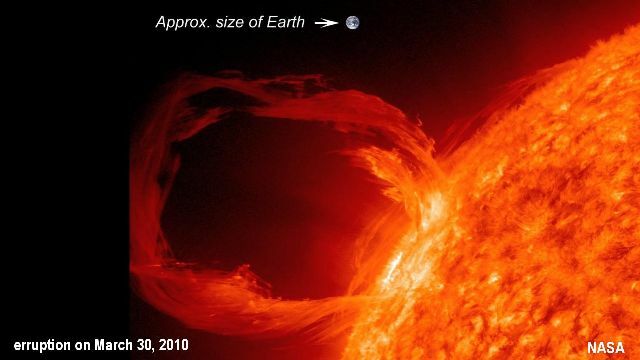 Solar mass-ejections are plasma showers erupting on a scale that dwarves our earth. If parts of these showers hit our earth they accumulate in the ground at whatever depths they can penetrate to. There, deep in the ground, the same electric pressure builds up that had ejected the plasma particles from the Sun in the first place. 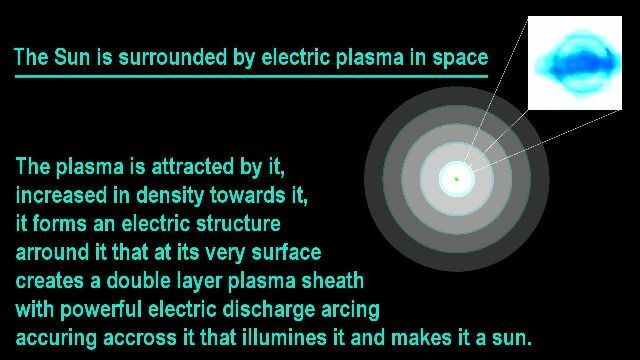 The solar plasma ‘pressure’ flowing into the Earth causes correspondingly large electric stress phenomena to build up in the ground, by the electric force that is 36 orders of magnitude stronger than gravity. Large electric stress explosions can occur, resulting in large earthquakes and related events, and a sharp increase of the number of the events as the Ice Age Transition unfolds. 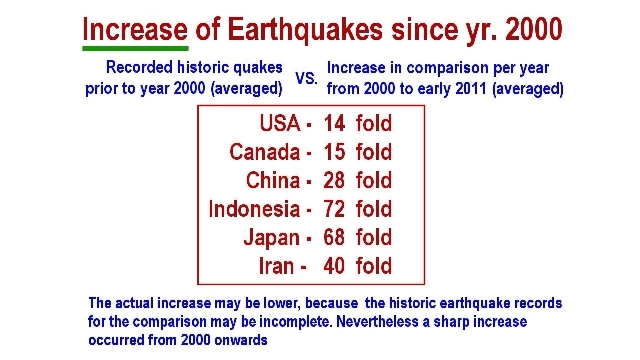 A sharp increase in earthquakes began in the year 2000, with increases from 14-fold to 72-fold over the historic average going back 200 to 1300 years. 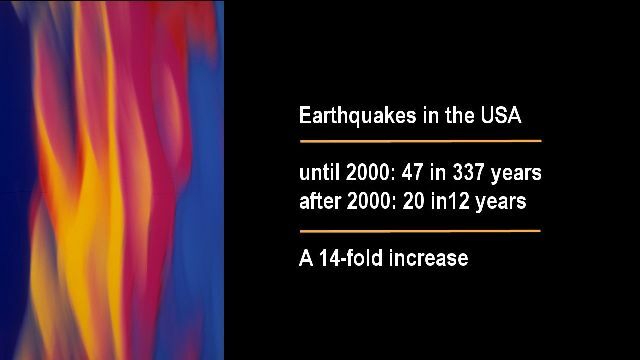 Earthquakes in the USA, before 2000: 47 in 337 years. After 2000: 20 in 12 years. A 14-fold increase. 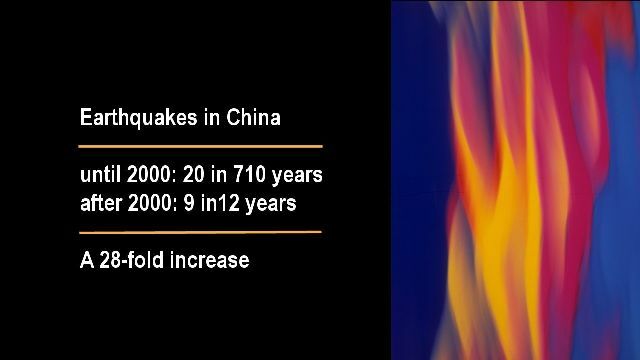 Earthquakes in China, before 2000: 20 in 710 years. After 2000: 9 in 12 years. A 28-fold increase. 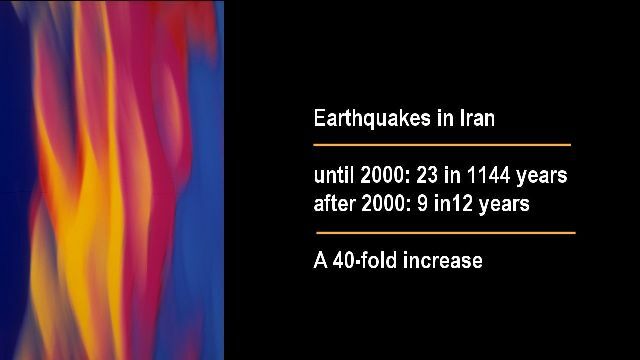 Earthquakes in Iran, before 2000: 23 in 1144 years. After 2000: 9 in 12 years. A 40-fold increase. 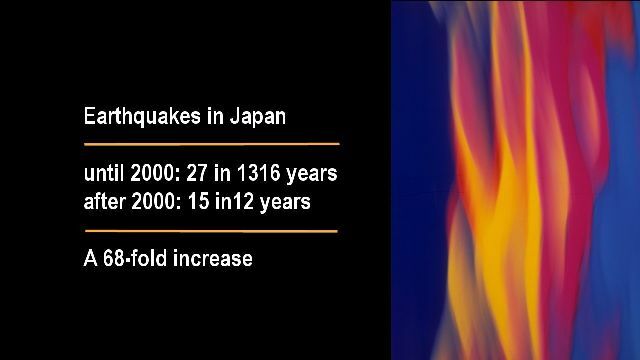 Earthquakes in Japan, before 2000: 27 in 1316 years. After 2000: 15 in 12 years. A 68-fold increase. 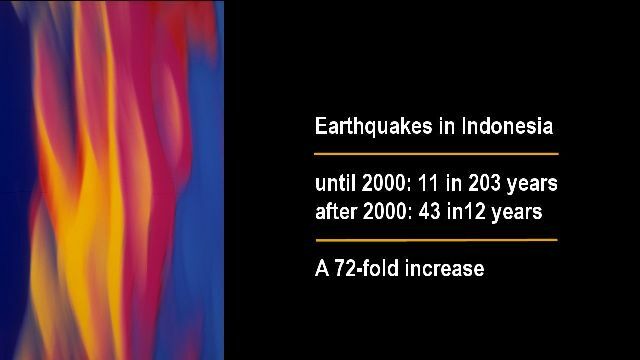 Earthquakes in Indonesia, before 2000: 11 in 203 years. After 2000: 43 in 12 years. A 72-fold increase. 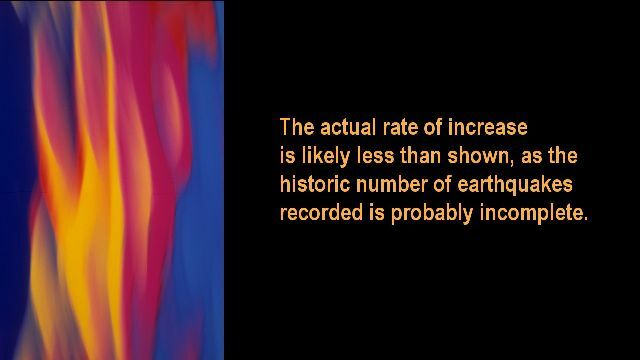 The actual rate of increase is likely less than shown as the historic number of earthquakes recorded is probably incomplete. 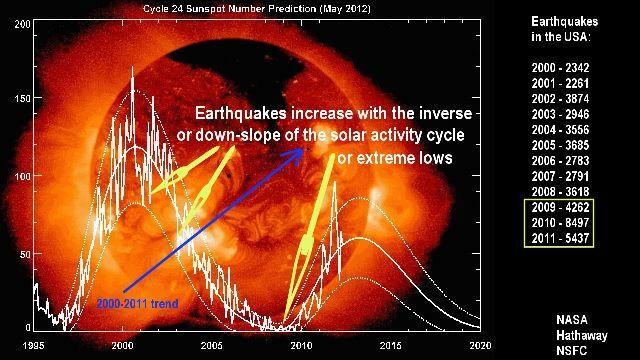 And even in the weaker sun, the number of earthquakes is increasing with the downturn of the solar activity cycle. In the USA the number of earthquakes per year doubled during the timeframe in which the weakening of the Sun began. Since a sharp increase in the number of earthquakes has occurred, coincident with the Sun is getting weaker, for which no end appears in sight, we face the task to prepare our world for the continuing increase in earthquake activity. The strategic defense of humanity, thus, becomes ever more necessary as we enter deeper into the coming Ice Age Transition that appears to be already at its beginning stage. 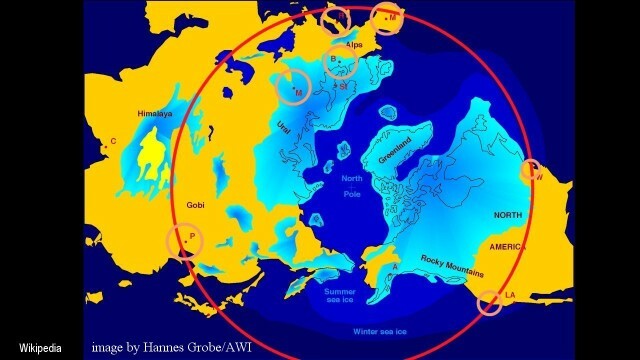 The sharp increase in earthquakes that has been experienced since Ulysses observed the weakening of the Sun may well be the most measurable precursor that we can get that a major astrophysical transition is in progress that matches what is known about the dynamics of Ice Age transition. As I said, that when the situation arises that the external plasma pressure around a sun is weaker than the internal pressure, which results in a weaker sun, a portion of the internal pressure is vented into space in the form of explosive mass ejections until a lower equilibrium is established. 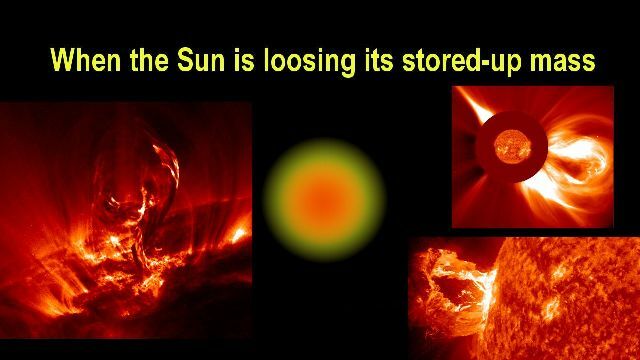 This a natural process in the solar dynamics, and a critical one for any sun, because if these ejections didn’t occur, the sun would eventually explode by the built-up electric stress. Such electric stress explosions actually do happen, though only extremely rarely. It is highly likely that the famous super-nova events are rare, extreme events of this type of explosive electric stress fracturing. Such events would happen when enormously large plasma pressure bears down on a star, so that the internal electric stress pressure overpowers the gravity of the star. 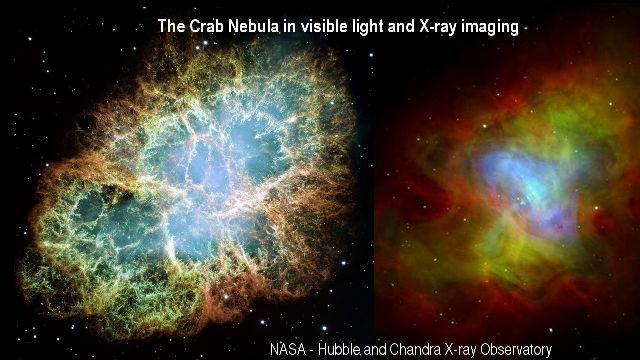 The Crab Nebula may have resulted from such a process of electric stress explosion. The Crab Nebula is known to be a hotbed of intense electric activities. The Crab’s remarkable, combined luminance is 70,000-times greater than the luminance of our Sun. 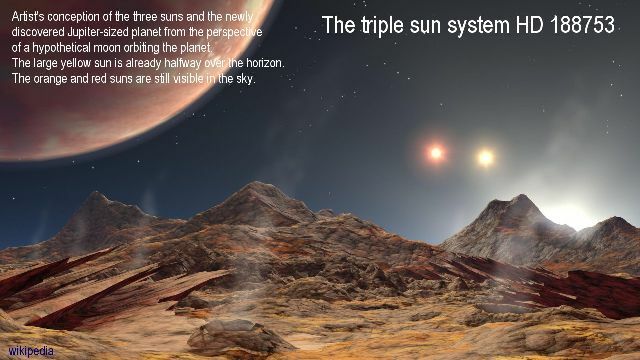 In lesser cases, when extreme plasma pressures build up in a star, with corresponding great electric stress inside the star, the over-stressed star merely splits apart into binary, triple, or quadruple star systems. The resulting electric stress division appears to be not uncommon among stars to the point that astronomers now suggest that single star systems, like our own solar system, might actually be the minority in the galaxies, or at least in our galaxy. Large coronal mass ejections are therefore healthy for a sun. 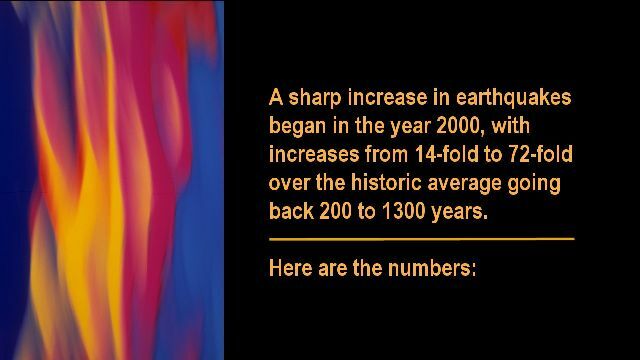 They occur at their largest when the electric environment around a sun becomes weaker, so that a lower equilibrium needs to be established, as in the case of our Sun during an Ice Age transition period. During the weakening phase the Sun will vent, or eject, large portions of its built-up mass in the form of large solar fairs. 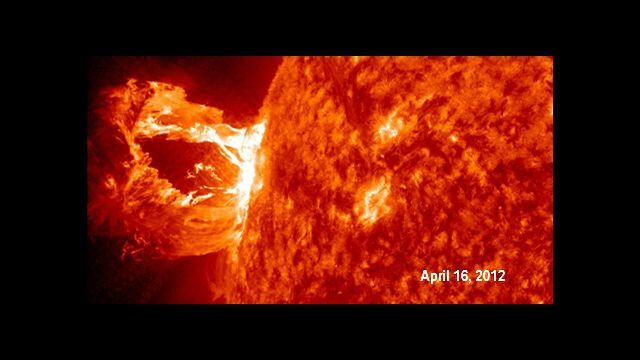 While even the most gigantic of these resulting large mass-ejection events are nevertheless ‘small’ events in the larger context of stellar dynamics, they are large enough to cause enormous effects on earth where the electric force builds up with evermore solar flairs hitting the Earth whereby the ejected storms of solar protons cut deep into the ground. As a result enormous electric stress-forces exist in the ground. When a major solar flair adds another shower to this background, may be the straw that breaks the camel’s back. 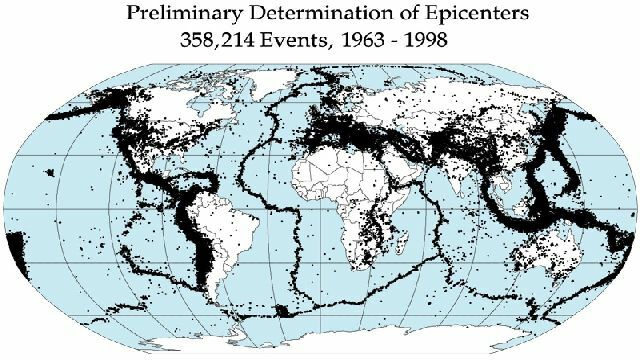 Most earthquakes thereby appear to be the triggered by electric stress phenomena that in some cases occur over large areas. Closely timed relationships have become evident between increases in earthquakes and the weakening of the Sun that the Ulysses satellite had measured. 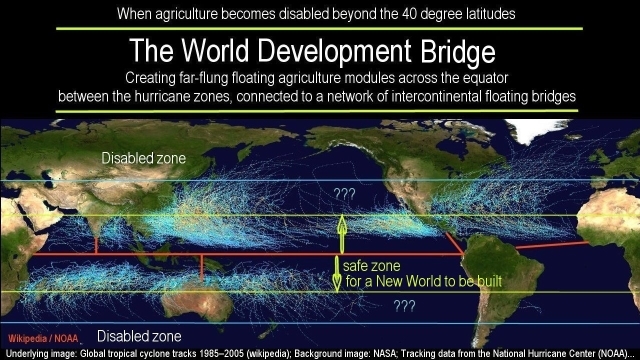 The strategic defense of humanity from the coming Ice Age Transition, therefore needs to focus on the earthquake factor as also a major factor for the immediate time ahead, because the dynamics involved suggest that we haven’t seen anything yet on this front. If the current increase in earthquakes and volcanism is an indication of things to come, we evidently need to reconsider the way we build cities and infrastructures, and power-generating systems. 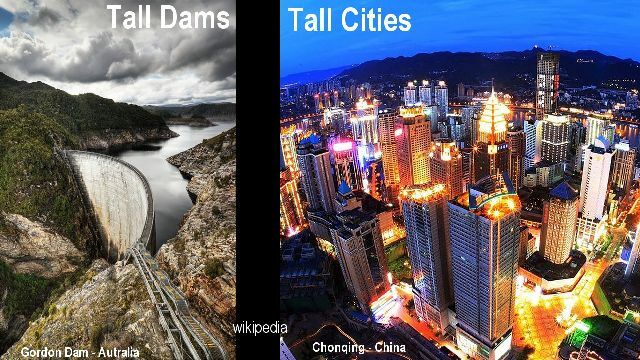 Enormously tall dams have been build, some twice as tall as the great pyramid in Egypt, holding back enormous volumes of water. How vulnerable will they be in our world of rapidly increasing earthquakes? Indeed, how vulnerable will our tall cities be? We have no historic data about what to expect in earthquake activity during the transition period as the Sun is becoming weaker. The last such period was over 100,000 years ago. The modern decapitated science prevents these questions from being asked, while the little that we already see speaks volumes in spite of blindness imposed by decapitated science. The linkage between solar mass ejections and earthquakes is graphically evident in the records produced by the Induction Magnetometer in Gakona Alaska that is the most sensitive instrument of its type in the world. 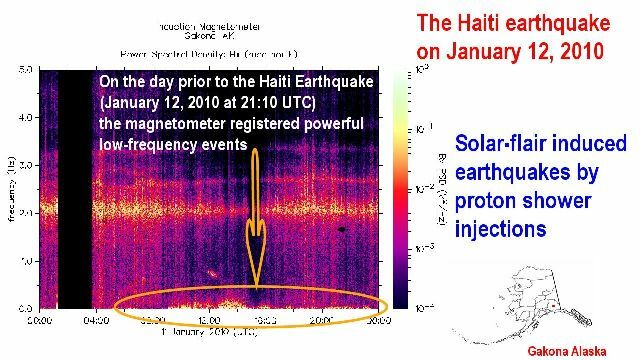 It registered some enormously intense, extremely low-frequency inductions just prior to the big Earthquake in Haiti in 2010. 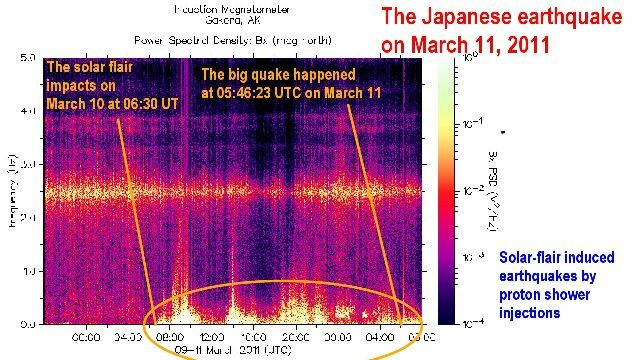 Likewise, prior to the giant earthquake in Japan in 2011, the same induction, only larger this time, were seen again for several hours leading up to the earthquake catastrophe. These two events, linked with the weakening of the Sun that is just in its faintest beginning, ‘scream’ to us that we haven’t seen anything yet. However, this, which we have not yet seen, is what we need to prepare for. 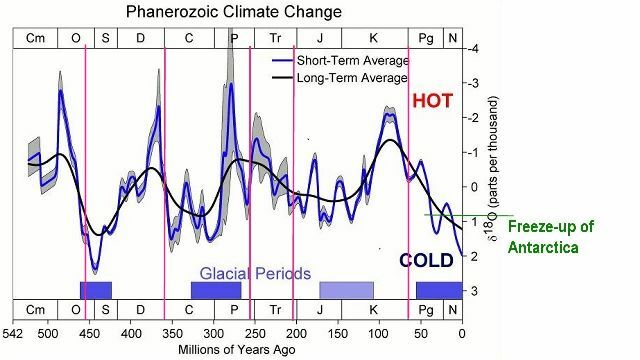 It is interesting to note in this context that 5 great historic mass-extinction events occurred at or near major, and at times gigantic, temperature downswings. These would be times of the Sun venting plasma in a big way to establish its plasma pressure equilibrium. Consequently these would be times of enormous electric stress in the crust of the earth, with correspondingly large earthquakes and massive volcanic activity, accompanied by a buildup of enormous electric potential between the ground and the ionosphere that may have resulted in electric discharge events of gigantic proportions, as could have ripped open the mantle of the Earth to cause the immense flood basalt eruption that have occurred during the extinction timeframes, that could also have excavated the craters that are often deemed to be impact craters, rather than discharge craters, like the Chicxulub crater in Mexico. 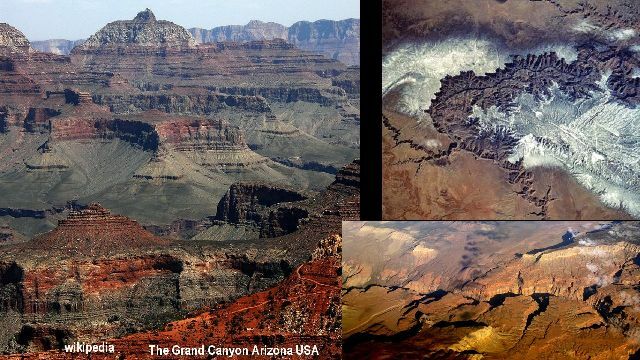 It has been suggested by researchers familiar with electric discharge ‘machining’ that the Grand Canyon was evidently excavated by a single electric discharge event, and by a minor one comparatively. All the expected eclectic features are present in the canyon’s features. While the coming Ice Age transition promises to be minuscule in comparison, we should nevertheless anticipate unprecedented volcanism and earthquakes, whatever this might mean. The huge task of creating an Ice Age Renaissance on the needed scale for the strategic defense of mankind, literally demands us to develop our inner resources as human beings to levels not yet imagined, in order to meet the challenge the universe presents to us. Sure, the challenge can be met physically, technologically, and economically in a decapitated world, but will we do it? This is a spiritual and cultural question. Can society break away from its empire dream of sealing riches from one another that develops poverty and impotence? The Ice Age Challenge should help us out of this dream as the needs for the future should jolt us to attention. It is tempting to say in the current impoverished dream state that the world-development project cannot be carried out, because we don’t have the energy resources to do it. This is true indeed in a decapitated world, but not in the real world. In the real world we have infinite energy resources laying at our feet unacknowledged and unused.